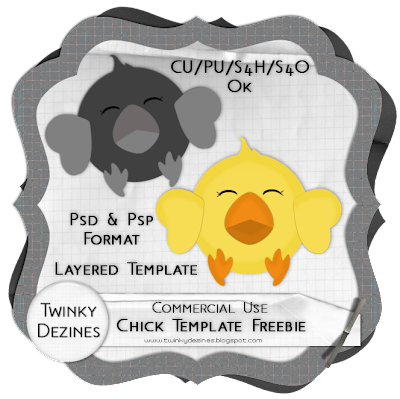 SOOOOO I have a cute little Chick template freebie for all you designers out there to use for your Commercial Use projects if you choose. I've also included the yellow chick in the preview in case anyone wants to use that too. I am working on a Bunny one, which I should have up in the next day or two so keep checking back. Anyway, hope you have fun using it! much for this cutie chick! i love it! Adorable little chick, thanks for sharing! Cute chick! Thanks for sharing! So so cute!!! Thank you again! oh they are so cute ! thanks a lot for sharing ! aaawww, too cute, thank you !! This is so darn cute! Thanks so much for sharing!